We want to thank STEP for joining our custodial crew this summer. While they earn needed life skills, they’re helping out our team in their summer cleaning. 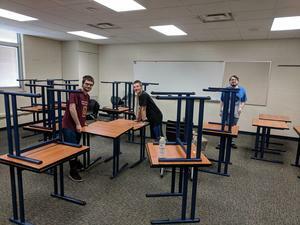 Three days a week at Otsego Public Schools, there are 10-12 extra helping hands thanks to STEP, which stands for Student Training Employment Program, and Juniper. STEP employs youth and prepares them for the world of work. They work in small teams led by trained community mentors and work in towns all across the state where needed. This group is partnered with the Allegan County Fairgrounds, City of Otsego and the City of Allegan; and we were fortunate to have them help here at the schools while our custodial crews deep clean each building. The STEP crew has been working ahead of our teams, wiping down desks, chairs, lockers and much more to prep it for the deeper cleaning that the OPS crew does. They have been incredible workers and helped out significantly as preparing our buildings for the next year is a lot of work. This program launched in 2015 by Juniper, LLC and offers participants the opportunity to participate in paid summer work with community partners as the employers. The students are paid minimum wage and gain up to eight weeks of work and educational experience.